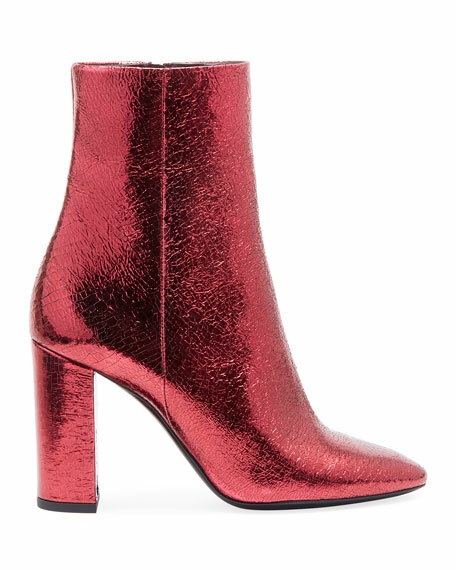 Saint Laurent bootie in metallic cracked leather. "Lou" is made in Italy. Balenciaga logo-embossed stretch-knit booties. 4.3" covered stiletto heel. Round toe. Pull-on style. Padded footbed. Smooth outsole. Chloe "Rylee" calf leather combat boot. 2.4" chunky heel. Detailed with cutouts and adjustable buckles. Pointed toe. Lace-up vamp. Leather lining. Rubber outsole. Fendi tall western boot in FF vitrified fabric. 4" two-tone stacked wedge heel with notch. Pointed toe. Pull-tabs at sides. 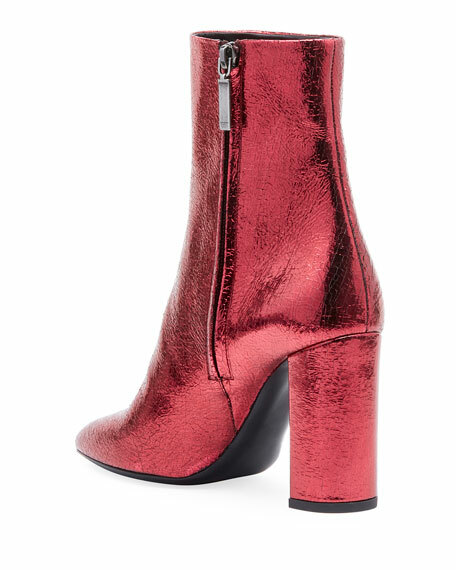 Fendi tall western boot in FF vitrified fabric. 4" two-tone stacked wedge heel with notch. Pointed toe. Pull-tabs at sides. Pull-on style. Leather lining. Smooth outsole. Made in Italy.